It’s the end of the year. How can I tell? The students want to play, play, play, and socialize but I have to get them ready for their rigorous final exams. What’s a teacher to do? Well if I don’t give into my students natural tendencies to want to play and socialize then my goose is cooked. One thing I love about being a teacher in the 21st century is that technology constantly gives us the ability to reinvent ourselves and our classrooms on a daily basis. Today I gave my classroom a brand new spanking look with Layar, a free augmented reality app. Perhaps after reading my three success snippets you will want to give your classroom a make-over as well. My students were going to have to complete 25 math problems in Socrative so I wanted to use Augmented Reality to start the class on a fun note. I placed a picture on the board with various types of equations in slope intercept form. My students were able to scan the picture in Layar and discover the “secret message” to get an “A” on your final call 1-800-MRS-PEPE. It was a cute brain teaser that I used as I asked them more sophisticated questions about the equations on the graph. I found that they enjoyed the change of pace and were more willing to do the harder work after starting class on a fun and playful note. In my Algebra II class we are reviewing for the final exam and one of the big ideas on the final is the quadratic formula. 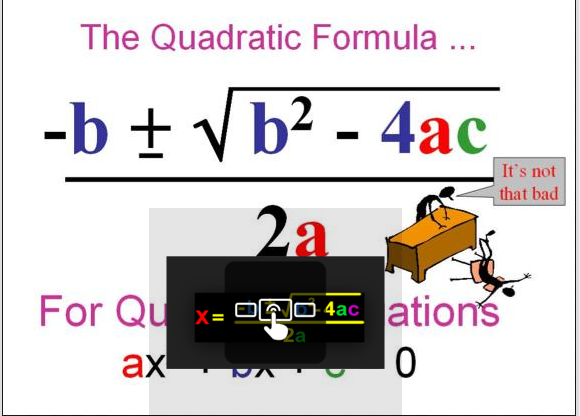 I superimposed a touch-screen photo gallery on top of a picture of the quadratic formula. 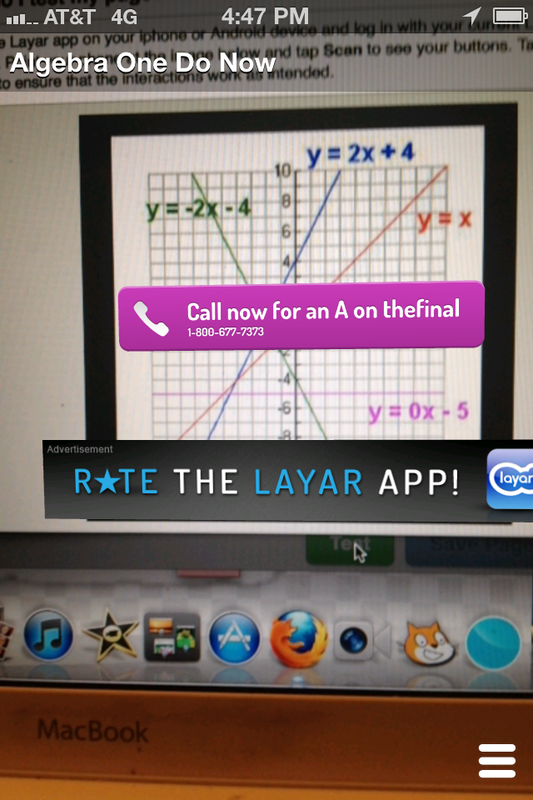 In the LAYAR app students could touch four different pictures in the gallery, all of the pictures linked to different You Tube videos featuring high school students singing songs about quadratics. Then as we played the quadratic songs they had to guess who the original artist was (Lady Gaga, Queen, and Adele were some of the artists whose songs had been morphed into quadratic formula ballads). Whoever says that you can’t hit all aspects of Gardner’s multiple intelligence schema never saw my math class. My students enjoyed having their Algebra II reality altered and augmented. My students are having a project based challenge style competition in my computer in business class based on Celebrity Apprentice. For the quarter-final today they had to design a commercial campaign for Australian Gold. As part of their marketing strategy they made print ads that became pop-up video galleries and You tube Videos when scanned with the Layar app. No matter what lens you viewed my classroom through today: augmented reality or not, it was a good day to be a teacher and a good day to be a student in my class. WICKED FUN!! I really love the way you use Layar in the classroom! 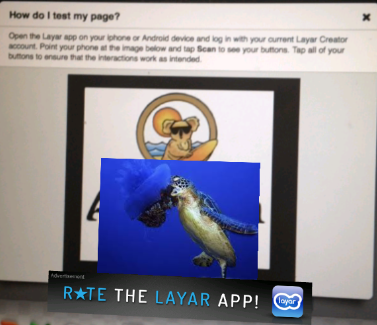 We’ve always had a soft spot for using augmented reality in education here at Layar. Great to hear it added value to your class. Thanks for sharing!